Sometimes you might want to ssh to a linux box and be able to fire up X applications and see the X windows on your Mac running X11. However, there are some customizations you need to do before everything works. Bingo! 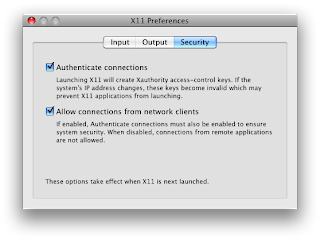 On the linux box, you can now run any X app, say xterm and the X window will pop up on your Mac box. I was trying to compile Valgrind (version 3.3.1 r8180, VEX r1854) for Mac OS X as per Greg Parker's instructions. This needs to be repeated with VEX/libvex_amd64_darwin.a which'll fail the same way. Continuing with make built valgrind successfully for me. The most common way to select the startup disk is using the "Startup Disk" preference pane. However, there are times when you want to do this using the command line. Here's a quick command to figure out the version of Mac.